We all want our students to develop good communication skills. It’s a priority for all students in special education, and particularly for students with autism. Consequently it’s something we need to think about right up front as we plan the classroom setup. Communication occurs more frequently when we engineer the classroom to support it. Because of this, I would say it is important to think about it at the start of the class. 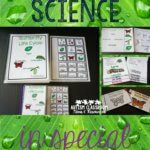 Check this post out if you would like to read the earlier posts in this series, the 10 Steps to a Well-Run Classroom, focusing on different parts of setting up a classroom for special education. 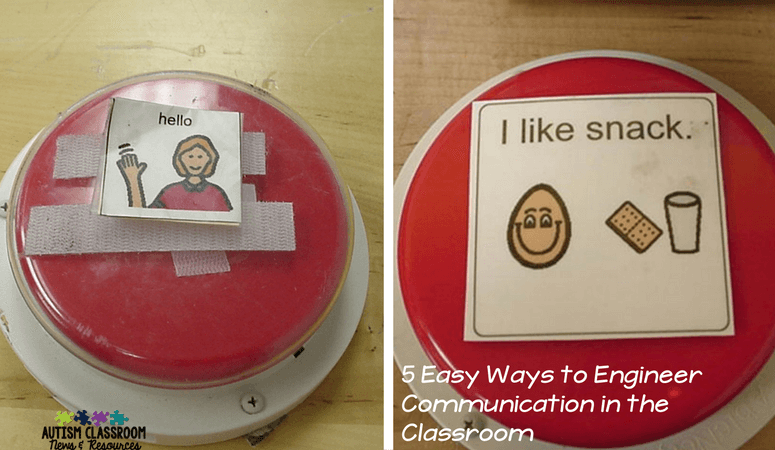 Here are 5 ways that I engineer the classroom to promote communication for the students. 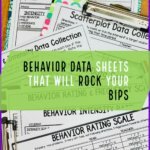 If you have been reading along with the series, you read about Teaching Plans or Teaching Intervention Plans. When I’ve completed this step in the classroom, one of the things I outlined was the student’s communication goals. I also will have outlined the instructional strategy and where the skill is going to be taught. The great part about this is that it makes it easy to go back to the teaching plan and know where you need to set up the communication systems for specific skills. Have a teaching plan that tells you that you are working on greetings with a student in morning meeting? And that the student has a speech-generating device (SGD)? BAM! You now know you need to set up a SGD in morning meeting with greetings. So the first step is to go through the teaching plans and make a list of all the communication strategies that need to be set up. The next thing I do is think about adding communication boards around the classroom. I have some common ones that I use throughout the year. And I have others that I add in as the year goes on or for special activities. Common ones I use are an art board, a music / movement board, an exercise board, and boards that go along with making requests in morning meeting (and also check here). (By the way, many of those links lead to free downloads of the boards, so be sure to check them out!). These boards can be ones that use exchanging visuals for materials, like the ones noted above. Or you can also have boards that support commenting and talking about activities. Boards like this one that provides the vocabulary for talking about play are great resources. They also are good for visually cueing students’ language. Usually there is at least one student in the classroom (often more) who needs visual cues for using language. For those students, I make a bunch of sentence strips with “I want ___,” “I have ___,” “I see ___,” “I like __” etc. I put them around the room in various activity areas to support communication with different functions. 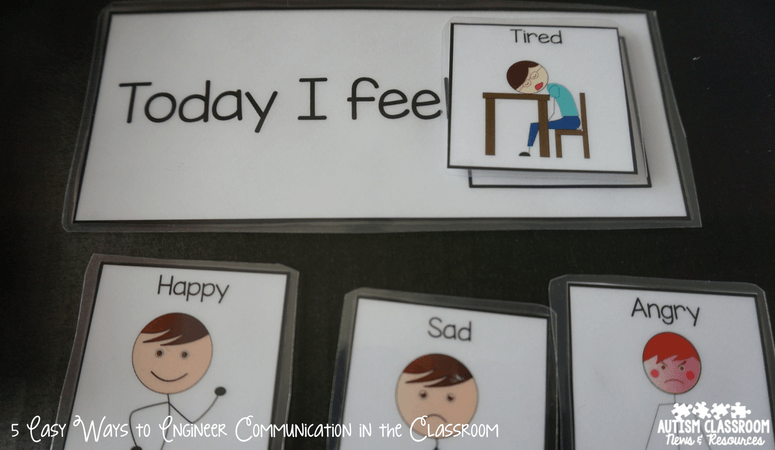 Students can use them to speak or add visuals to them (or just point to something) as a way of increasing their functions of communication. Obviously, I have to make sure that each student’s AAC needs are met per their IEP (see the Teaching Intervention Plans in #1). In addition, though, I like to engineer the classroom with additional SGDs for common activities if I have students who are nonverbal or not functionally verbal. I do it similarly to the communication boards, but I often use the SGDs (which might include tablets with AAC software) for participatory functions as well as communication. So, common songs or chants we say, I put a part of on an SGD so that students can participate–for instance in the clean-up song. If we use a good morning song at morning meeting, I might have a switch that is one of the lines of the song. Or I might have a switch / button that has just “good morning” so each student has a voice to greet others. Then, look around the room and think about what it is important for other students to hear a voice of a student who is nonverbal. Then program an SGD for that. Try to save one SGD or two for special or changing applications as well. For instance, I often use one for the book we read as a class each day. I might put a repeating phrase from the book or (if I have more than one button on the device) I might put the vocabulary we are focusing on. This way the students can find the right vocabulary to talk about the book and answer questions. Finally, I have to make sure that the students’ communication needs for behavior plans are met. And I like to put a variety of communication visuals around the classroom to support common behavioral needs. Some common functional communication strategies include asking for a break (for escape-related behavior), asking for attention or ways to gain attention appropriately (for attention-seeking behavior), asking for assistance or help (for escape-related behavior), and reminders to wait (for a turn or a teacher’s attention). 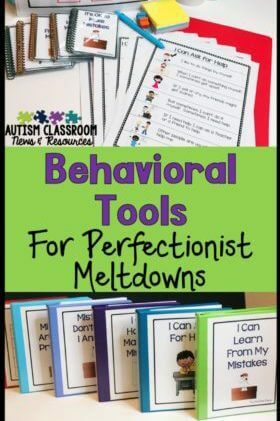 These are common triggers for challenging behavior and I like to have the communication supports close at hand when I need them to prevent outbursts. I tend to put these types of visuals on all the tables in the classroom and at individual student desks as needed. 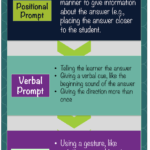 This makes them easy to grab and easy for students to see on their own when needed to be proactive. 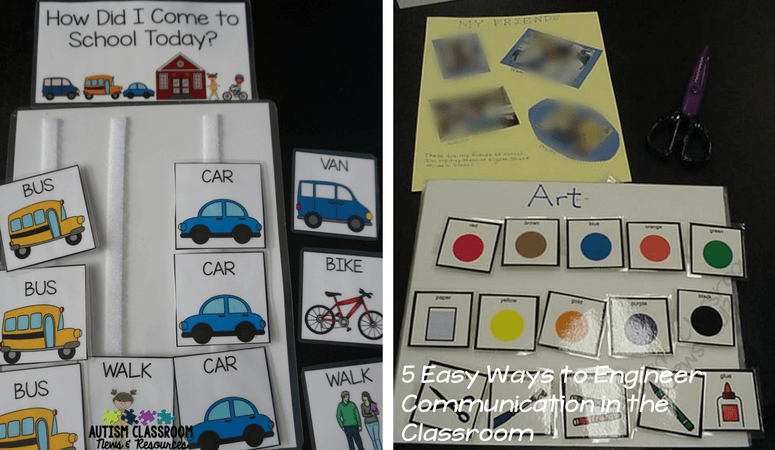 Obviously as time goes on I add more communication supports to the classroom as they evolve. However, this gives me a basic start to the year that I can build on. 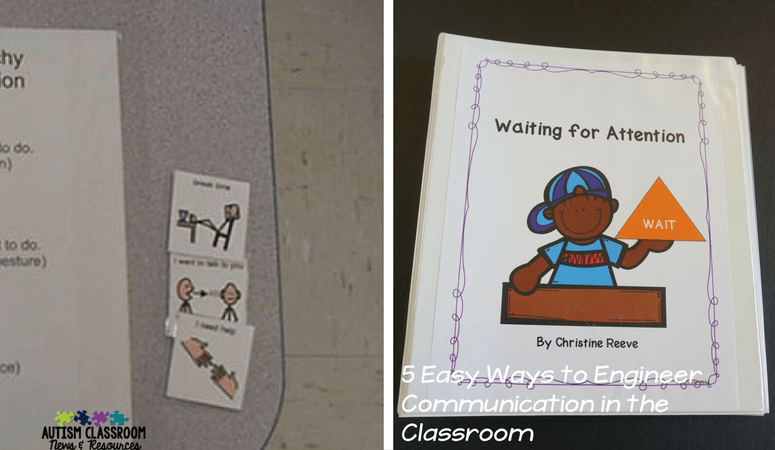 Want to read more about communication strategies I use in the classroom? 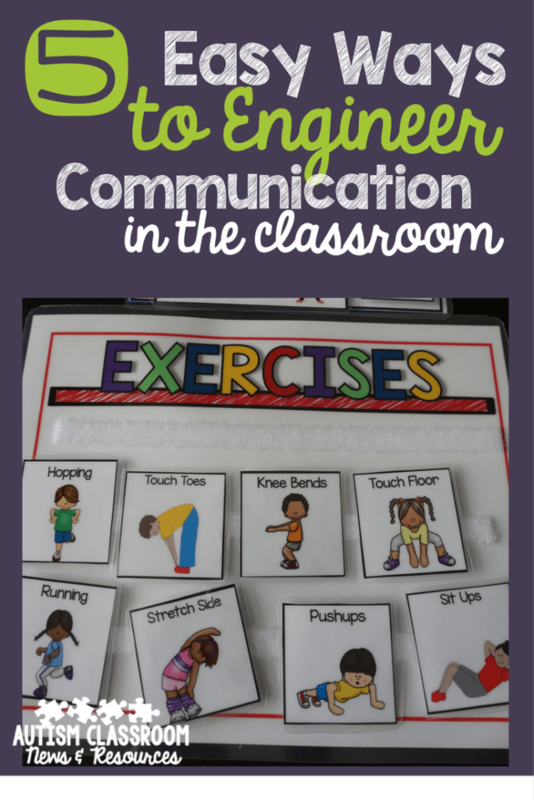 Check out this post on 10 Reasons Why I Like the Picture Exchange Communication System and this one on Supporting Language and Communication Through Classroom Engineering. If you are looking for ideas and supports for creating communication opportunities, you might like Creating Incidental Opportunities for Learning Across the Day. 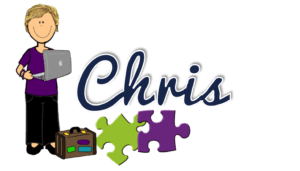 Chris, you have some great ideas and I love the emphasis on the visuals in the classroom. Please also let your readers know about the important of adding core vocabulary to communication boards and visuals, so that students learn to use words that give them a wider variety of contexts in which they can interact/participate. It also frees up teacher and SLP time not to have to program all those specific words for each book or topic, when teachers teach non-referentially. I really like having the communication on the table. Quite often behaviors for attentions and escape happen at the table. I think I will have to modify it with so that they can point to it because 2 of my students will eat them. As I shape that behavior I can add the picture icon Last year I had clipboards with frequently used words but they would never be available all the time and could become projectiles. This is a great post.